We don’t write so much as rewrite. Sherylyn and I go through five and more major rewrites and dozens of minor ones for each novel. Not so for blogs. Our blogs get three drafts. The initial draft, one re-write if we have the time, and then a final polish before we post. As you can imagine, they’re nowhere near as polished as our novels. Once a blog is posted that’s how it tends to stay. We’ll fix typos or bad grammar but mostly what you see initially is what you get. It’s rare, but we do occasionally rewrite articles, either because it they’re badly written or because the post doesn’t get across the meaning we wanted. 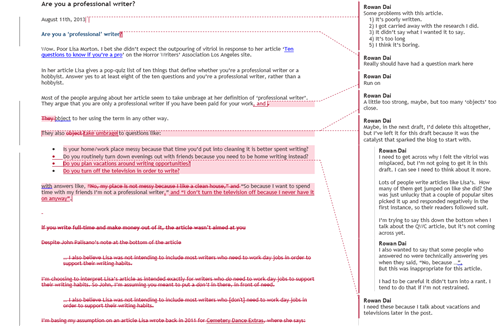 The blog I wrote last week—Are you a professional writer—needs rewriting. When we started A Novel Idea we planned to show how a story changed from first draft to final. Rather than rewrite last week’s post we decided to show what we would edit. And give the reasoning behind it. So here are the changes. Click on the image below to see the marked-up revisions as a PDF. 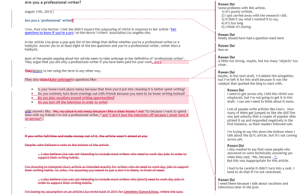 Are you a ‘professional’ writer? Most of the people arguing about her article seem to take umbrage at her definition of ‘professional writer’. They argue that you are only a professional writer if you have been paid for your work, and object to her using the term in any other way. Do you plan vacations around writing opportunities? Do you turn off the television in order to write? with answers like, “So because I want to spend time with my friends I’m not a professional writer,” and “I don’t turn the television off because I never have it on anyway”. If you want to be a writer you make it a goal and you work toward that goal.